The Flash addresses the tension between Nora and Iris as a metahuman threat starts to manipulate the news in Central City. This isn’t a show that could ever be accused of trying to be political which is fine because it’s not that sort of show. Supergirl has been doing a lot in this space this season and has had a lot of success in this area but The Flash hasn’t typically tackled that sort of storytelling. Based on this episode it would seem that there’s a good reason for that as the execution of the attempt to make a point that resonates with modern audiences is somewhat problematic. In this episode, the threat comes from Spencer Young (Kiana Madeira); a sensationalist blogger who has a phone that can hypnotise people into acting out whatever headline she wants them to. Her meta tech phone allows her to manipulate people and events so that she’s first to the story that she creates. It’s a reasonably clever idea as far threats go and there’s no malevolence to Spencer as she’s only interested in making herself more popular which is a clear reference to plenty of internet celebrities stirring up controversy in order to make themselves known to lots of people and feel relevant in a media saturated world. Spencer is just such a person who happens to be doing it well enough to be considered a threat. In essence she is someone who uses the power of her phone to encourage people into doing bad things. In case that was too subtle Iris confirms what the writers are getting at by directly referencing fake news. It’s not a bad idea to have people literally brainwashed by fake headlines that come from untrustworthy sources as that is definitely something that happens in the world we live in but beyond making the point the episode has very little to say about it. There’s no sense of what the impact is beyond damage that is fairly standard weekly stuff on this show anyway. The fact that Spencer isn’t outwardly villainous works well enough because it hammers home the idea that some people only act this way for the attention rather than actively trying to harm anyone. The meta tech concept also sends the message that this potential exists within your device and can be used by anyone at any time. It’s both obvious and clumsy but at least clear. There is a built in rivalry at play as Iris has a less popular blog than Spencer that covers similar territory but Iris apparently reports from a platform of integrity rather than creating click bait headlines to increase her readership. As such they are along similar lines with very different ideologies that clash with one another. The writers failed to notice that this was the real story here and didn’t capitalise on the potential for a villain to relate directly to Iris and offer her a challenge that fits her particular skill set. They do share some dialogue but it’s not all that meaningful and doesn’t tie into that potentially interesting rivalry. The solution wasn’t all that interesting either as all that happened was Barry caught her and confiscated the phone. A more fitting resolution would have been discrediting Spencer in some way, perhaps by Iris using her own journalistic skills to convince people that she was a far more credible source of information. Essentially her defeat could have been along the lines of “ignore her and she will go away”. Unfortunately it just feels like another villain of the week plot with a half baked attempt to be socially relevant and it doesn’t work because it’s all setup and no pay-off. A lacking villain plot doesn’t diminish the exploration of the Barry, Iris and Nora dynamic. 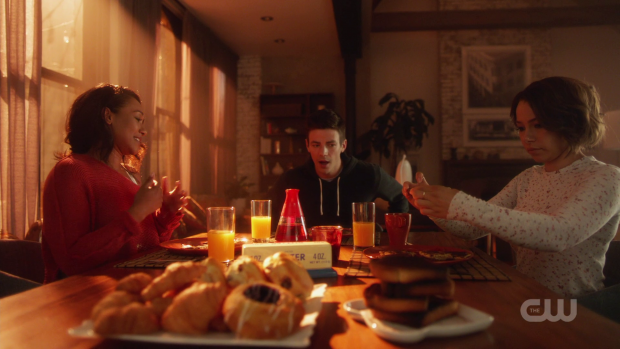 Predictably Nora moving in with Barry and Iris isn’t the solution to the problem of them failing to connect like she hoped. We are immediately shown that the situation is as bad as it was before through Nora’s frosty dismissive attitude towards Iris’ attempts to find some common ground with her. This does provide an opportunity for Barry to see what Iris has been talking about and try to understand where she’s coming from. I have to applaud the writers for not letting this problem linger for too long. Previous seasons would have had this tediously drag on for a lot longer but 4 episodes in and we have an answer to this mystery. Nora resents Iris because she was fitted with a power dampening chip when she was young so that her powers wouldn’t manifest. She didn’t learn this had happened until 6 months ago -from her perspective- and feels betrayed by her mother who lied to her about what she was for her entire life and actively prevented her from knowing the truth about herself. At first Iris is taken aback by this news and feels her future self did something monstrously unforgivable that justifiably fractures the mother/daughter bond. Upon further reflection she decides that she must have had a really good reason for doing it because she feels that a decision like that would not be arrived at lightly. I can understand why Iris might think that and it’s a testament to how problematic her character has been over the run of the show that this explanation doesn’t work. There have been numerous examples of her making impulsive poorly thought out decisions with no mind for the true consequences of her actions so when Nora explained I was inclined to believe that Iris was wrong to do that to her. Given that this happens a few years from the present day of the show then there it’s possible to give her the benefit of the doubt. Iris of the future could be a much more mature and thoughtful person though it’s down to the writers to create that character before the “Crisis” event that the future newspaper headline talks about come to pass. For now we’re supposed to accept that Iris made that decision for what she believed to be the right reasons. 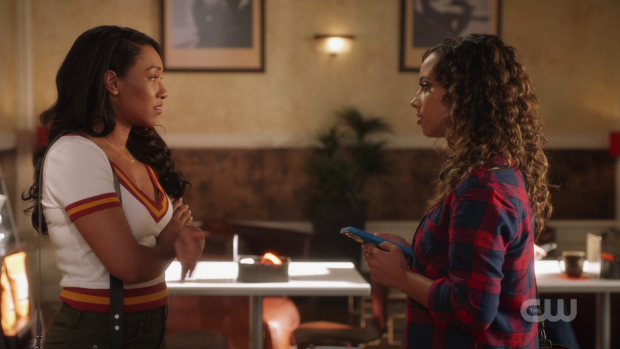 In this episode the knowledge of what Iris did makes for some interesting drama as it’s immediately understandable why Nora would keep a distance between them and it’s interesting to see Iris second guess a decision she hasn’t even made yet. The fact that she stands by it does show how confident she is and that she trusts herself to a large extent. Surprisingly Barry stands by her decision because he also has faith that she would have had a good reason for doing that to her daughter. Hearing that isn’t easy for Nora and she quickly gets away from her parents who have betrayed her from her point of view. She runs to Joe’s and asks to stay there because she needs time to sort out the feelings she has. Running off to stay with the grandparents when you don’t get what you want from your parents is a very human and relatable reaction plus it creates an opportunity for what will undoubtedly be some excellent advice from Joe as to what Nora should do about her current situation. This is all very positive because things are moving on naturally and new situations are being created by organic character drama that is compelling to watch which makes for a vast improvement on the last two seasons. As for why Iris might have suppressed her daughters powers it’s easy to fill in the blanks to some degree. The loss of Barry must have been devastating for her and a single mother with a super powered baby might feel overwhelmed to the point that she can’t handle it so takes Nora’s powers away from her to make life easier when she is on her own. Another possibility is that whatever was responsible for the disappearance of Barry might be targetting Speedsters which puts Nora in danger if she is ever discovered. It’s also possible that the future Nora belongs to is the same future that Zari is from where metahumans are hunted. All three of these could be seen as reasonable grounds for Iris to do what she did but for now the why doesn’t matter as much because the impact it has on the dynamic between these characters is a far more fascinating thing to explore. I continue to be surprised and impressed by how well Ralph is being used this season. Aside from a return to irritating form in a prior episode he has been much improved this season with more focus on what he can bring to the show and less emphasis on tedious comic relief. I mentioned last week that having Ralph and Sherloque Wells around might end up being redundant because having two detectives could be unnecessary but pairing them up turns out to be great for both of them. Sherloque doesn’t just think he’s a genius, he knows he’s a genius which comes with a conceited and dismissive attitude to what others might think. 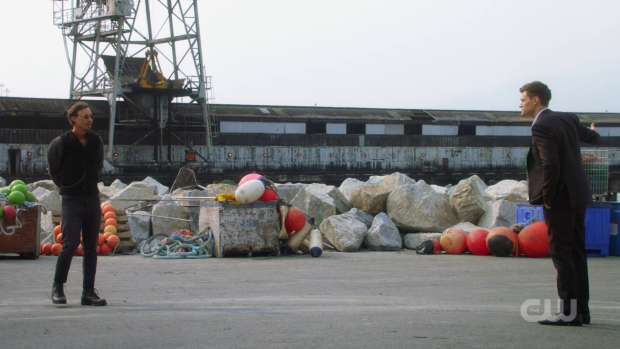 This presents a challenge for Ralph to prove that he has something to contribute and that he can explore angles that Sherloque hadn’t considered. This is shown through Ralph’s idea to track down the mask that Cicada wears because he feels that it must be work for a particular reason beyond concealing his identity. He thinks that it’s a bust when he finds a factory chain where thousands of employees wear the same mask but it’s not entirely useless as Sherloque is able to deduce that Cicada has injured lungs judging by the intensity of his breathing as battles become more intense. 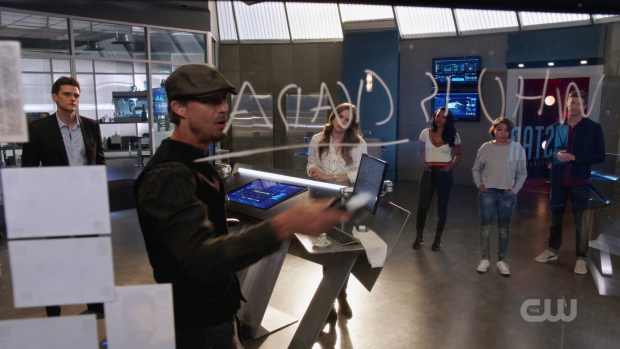 This is after dismissing that fact earlier in the episode but by the end there is a slightly clearer picture of what Team Flash is dealing with and a potential weakness that could be exploited. None of that would have happened had Ralph not forced the exploration of the mask angle so there is a definite place for both detective characters. I’m still unsure about Sherloque as he seems a little too goofy to have any real longevity especially when compared to prior incarnations of the character though he isn’t as insufferable as the previous episode would suggest he might be. I did enjoy him trying to show his prowess as a detective and doing little more than writing everything down that people said without any real conclusions being drawn. It all ties into the idea that he isn’t all he bigs himself up to be. Cicada took something of a back seat in this outing though there was a quick attempt to humanise him further by showing increasing strength contrasted by rapidly increasing pain therefore enhancing the tragic aspect of this character as what gives him powers also seems to be killing him. Nora is indirectly responsible for this as well as it was a dark matter infused piece of falling shrapnel that caused a completely different Cicada to be born. A strong episode that is clumsy in its execution of the villain plot but excels in how it handles character dynamics. The one thing the villain has going for her is a lack of malevolence; she is more motivated by popularity than anything else and just has no real problem with what she has to do to achieve that. The writers fail to capitalise on the potential to make this a uniquely Iris problem and the allegory relating to fake news and internet popularity falls flat. The Barry, Iris and Nora dynamic is as strong as ever thanks to rapid yet organic movement through the plot in delivering an answer to what causes the rift. Iris considering it before deciding that she must have suppressed Nora’s powers for a reason works if you accept that Iris is that sort of person despite a lack of evidence supporting that but it is interesting that she trusts herself to have a valid reason. Barry backing her up makes sense while being surprising and Nora running off to Joe’s is easily relatable because running off to the grandparents for support is a very human thing to do. Ralph is continuing to improve and shed his more annoying qualities. Having Sherloque around is great for him because it encourages him to prove his worth and use the skills that he clearly has. Even though the lead on Cicada appears to be a bust it allows Sherloque to consider a different angle and find a potential weakness that could possibly be exploited. 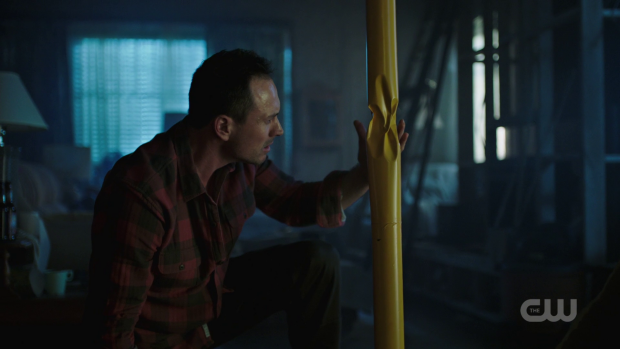 Cicada is used lightly in this episode but the tragic angle continues to be explored by showing that his increase is strength might also be killing him.